How do I edit a content module in Practice? Content modules can be edited while they are a draft and even after they have been published. 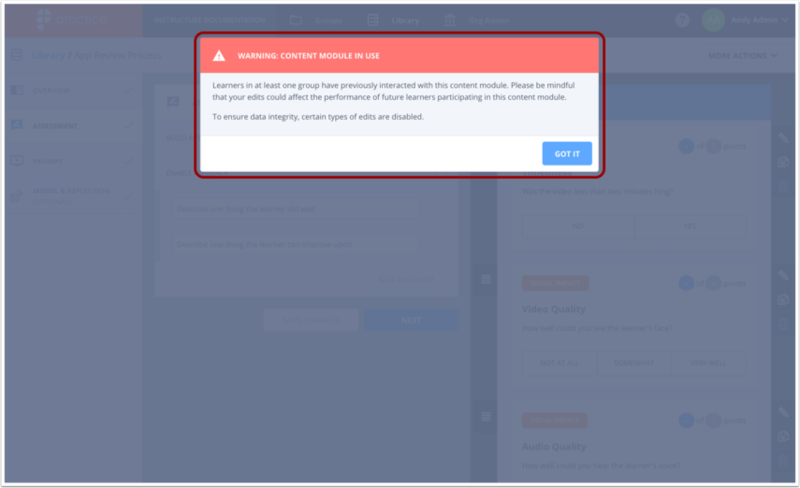 However, you should be selective about editing content modules that Learners have interacted with, as any changes that are made will impact Groups currently using the content module as an exercise. You are still able to edit the text of all aspects of the content module at any point. Select Overview  from the left side navigation. From here, you can make changes to both the title and the content module description. You can also download previously-uploaded supplemental content by clicking the file name . Once you have made your edits, select the blue Save Changes button . Select Assessment from the left side navigation. From here, you can make changes to Assessment Criterion (including competencies, scale descriptors, and scale values) by selecting the Pencil icon. 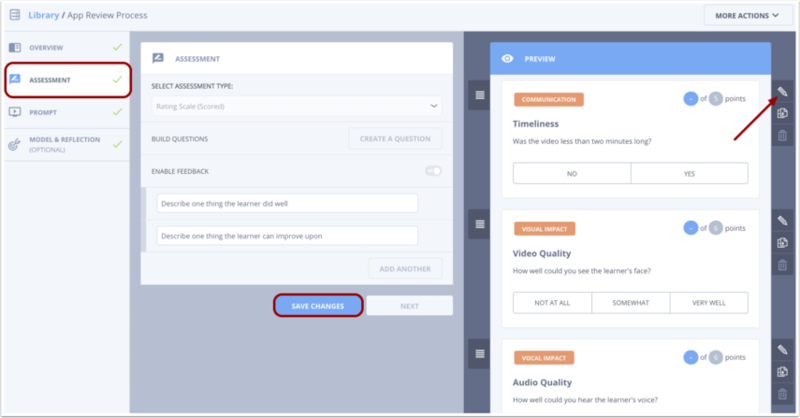 You can also make changes to the Structured Feedback Prompts. Once you have made your edits, select the blue Save Changes button. Click the Prompt tab . From here, you can make changes to the prompt file , instructions , and caption file  (if your prompt file is a video). 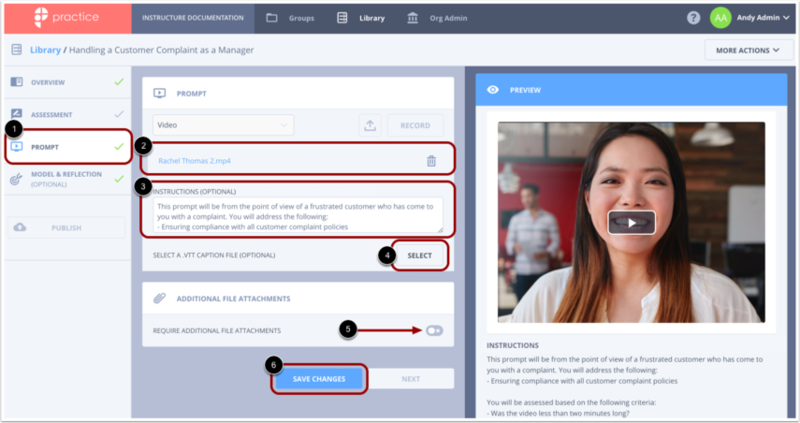 To require learners to attach additional files to their responses, click the Require Additional File Attachments toggle button . You can also download a previously-uploaded prompt file by clicking the file name . Once you have made your edits, click the blue Save Changes button . Click the Model & Reflection tab . 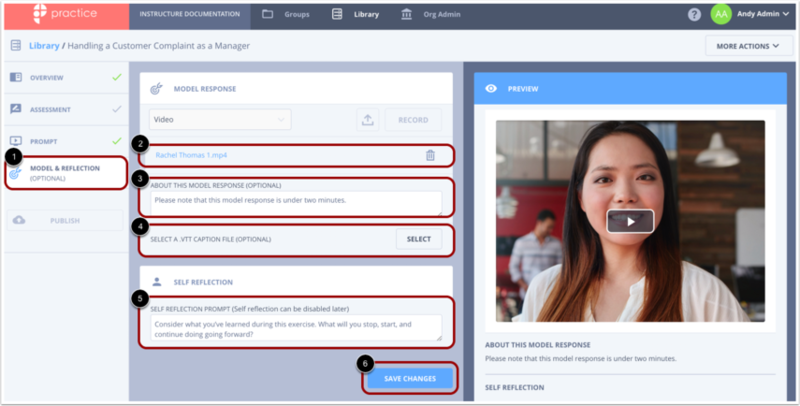 From here, you can make changes to the model response file , About This Model Response text , caption file  (if your model response is a video), and self reflection text . You can also download a previously-uploaded model response file by clicking the file name . Once you have made your edits, click the Save Changes button . Previous Topic:What is the Exercise Dashboard in Practice? Next Topic:What is the Learner’s Submission page in Practice? Table of Contents > Exercises and Content Modules > How do I edit a content module in Practice? What is the Exercise Dashboard in Practice? 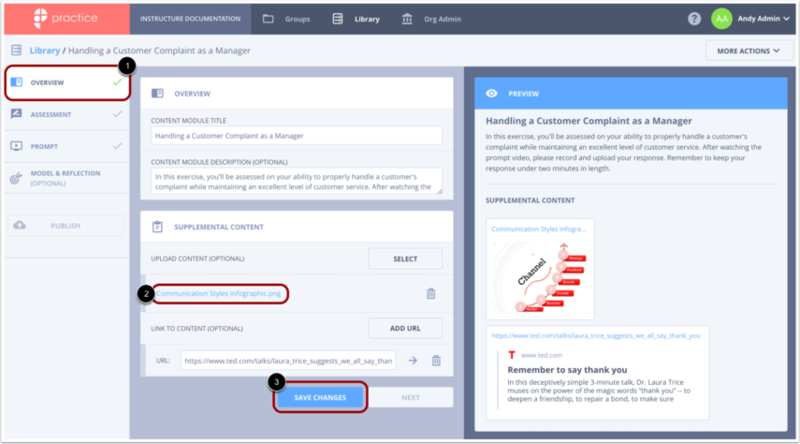 What is the Learner’s Submission page in Practice?